“I happen to believe that genius makes people weird,” a storyteller once said, explaining how Johnny Appleseed could be at once so peculiar and so profound. Between 1801 and 1812, Ohio and the Old Northwest territory runs wild and brutal, with a fragile peace, savage living conditions, and the laws of civilization far away. Still, settlers stake everything they own on the chance of building better lives for themselves in this new frontier. John Chapman--aka Johnny Appleseed--knows this land better than any white man. 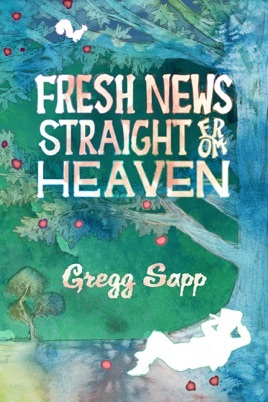 Everywhere he goes, he shares the “Fresh News Straight from Heaven,” which he hears right from the voices of angels who chat with him regularly. God had promised him personally that he could build peace by growing fruit. Convincing people of that vision, though, is no easy task. Most folks consider him mad. This land teems with a miscellaneous assemblage of soldiers, scoundrels, freebooters, runaway slaves, circuit riders, and religious cultists. Ambitious politicians, like Aaron Burr and William Henry Harrison, dream of creating a new empire there. Meanwhile, a reformed drunkard emerges among the Shawnee as a Prophet, one who spoke with the Great Spirit, Waashaa Monetoo. Along with his brother, the war chief Tecumseh, the Prophet begins building an Indian coalition to take back their land. Even while the tensions mount, Johnny, with angels urging him on, skates blithely through the crossfire and turmoil, spreading his message, impervious to the mockery and derision being heaped upon him. Finally, however, his faith is challenged when war breaks out in the land, leading to the bloody battle of Tippecanoe between Harrison’s army and the Shawnee Prophet’s warriors, and ultimately to the declaration of the War of 1812. A violent massacre near the northern Ohio town of Mansfield leaves its citizens terrified and vulnerable. In a desperate act of faith, Johnny promises the people that he can save them. Thus, he dashes off on a midnight run, seeking to spread peace across a land on the brink of war. With so many lives at stake, Johnny must confront the ultimate test of his convictions.